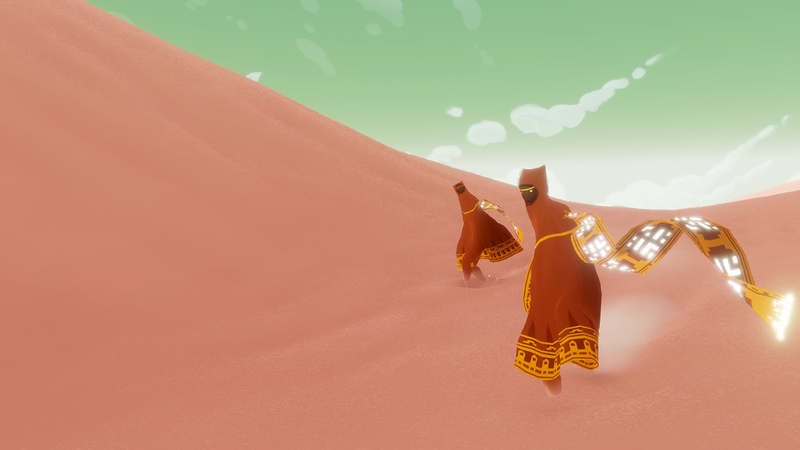 Journey is not your typical video game. It does not try to be, and that is a good thing. It is more of an experience, often compared to titles like The Unfinished Swan, or to some extent, Limbo. 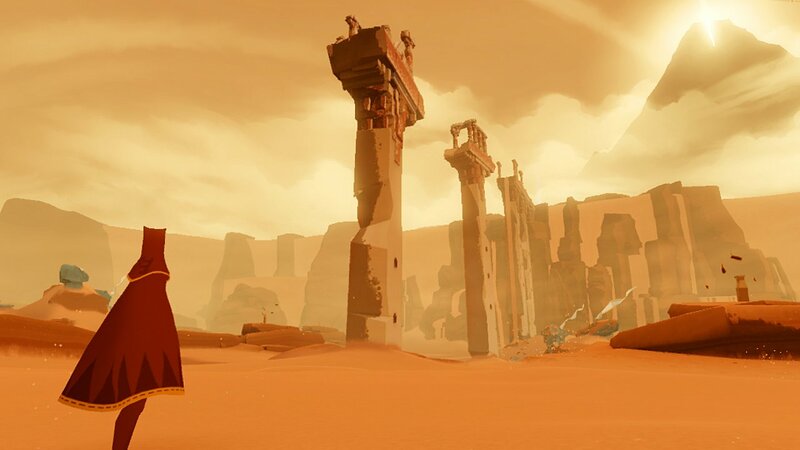 On the one hand, because Journey uses a fairly unique style and presentation, I can understand those comparisons, but Journey is also very much its own game. 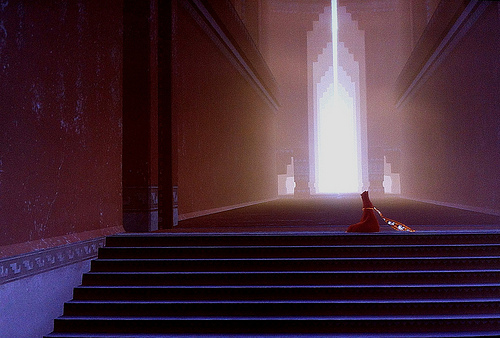 When you first start Journey, you are given very little context. I found myself simply wandering about, taking in the very pretty visuals while trying to grasp on to what the game wanted me to do. Over time, I realized that the game wanted me to spend time in the world, exploring and taking it all in - and I was more than willing to do so. 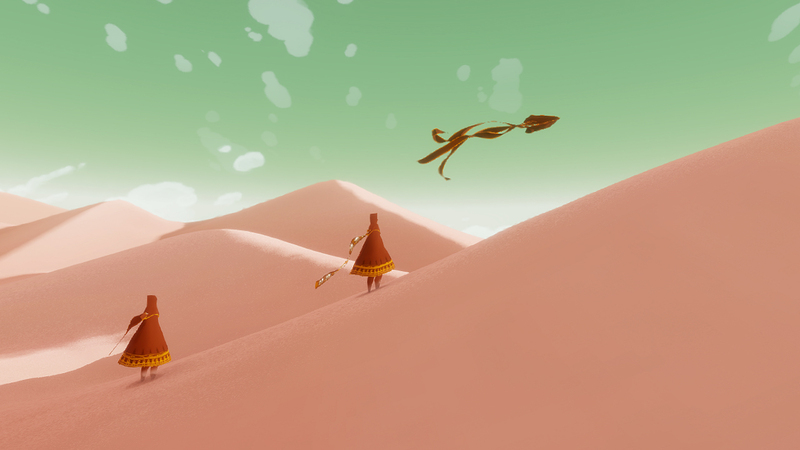 However, Journey also moves on beyond just pretty visuals and music, because there is a game under its cloak as well. You do have an objective, and there are obstacles between you and that objective. The trek becomes harder the further in you go, while telling a story through visuals. Probably the prettiest PlayStation Network title I have had the privilege of playing. 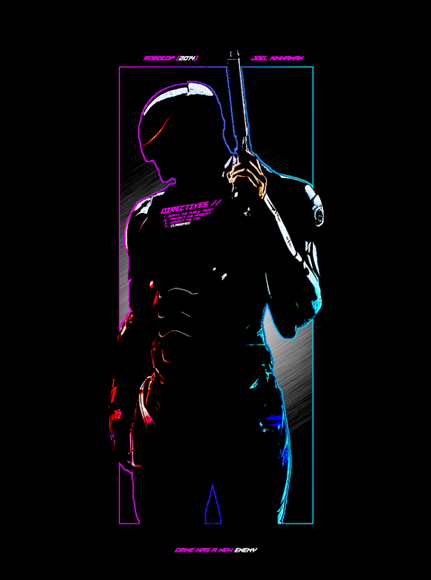 The use of colors is almost always pleasant, sometimes even fascinating. More than that however, the way the characters and environments move blend wonderfully with the controls, which have a fluid sort of floating quality to them. Though most of what you see advertised for Journey is the desert sand, there are other environments equally well represented. 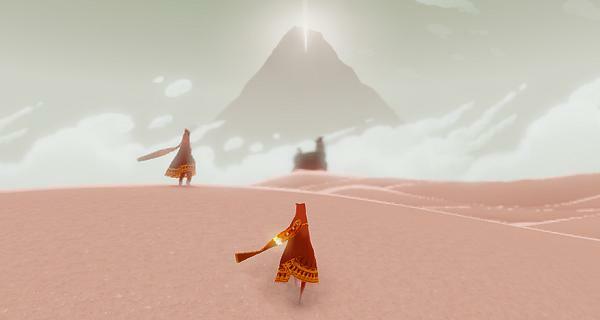 The music is every part the equal of the visuals in Journey. The score is beautiful and the sound effects while simple enough, compliment your actions wonderfully. Characters do not speak, but there is a sort of tonal language that you and others you encounter can use to 'communicate' - and it is really quite fascinating when you think about it. The controls are simple enough, but their intuitive nature makes it easy to pick Journey up and simply start playing. There were no tutorials, no long-winded training sessions. I took control of my character out in the sand, and the game pointed me in the 'right' direction, while still encouraging me to explore the world around me. There are challenges in the game that do take some trial and error, but for whatever reason I never found the lack of explanation frustrating. The experience itself was so enjoyable that it just felt like I was organically learning what I was supposed to be doing. The multiplayer component was something I touched on above, but it is an interesting part of the puzzle. You can encounter others just like your character. They too are on this unnamed journey. You cannot text or talk back and forth through a headset - you are simply experiencing the game together, making small tonal sounds once in a while when trying to draw some bit of attention to yourself. I will talk a bit more about the multiplayer here as well, touching on my own experience with it. I saw a handful of others on their journeys, but never spent any real time around them - until the last third of the game. One walked up to me, sat down and seemed to be waiting to see what I was going to do. I pressed the tone button a few times to indicate that I was there - but in fact had just been simply looking over my environment. This person had a very long scarf - an indication they had explored and found even more than I had. They stood up, walked a bit and stopped before turning their character around to look at me. I took it to be a silent invitation. I stood up and followed their character, and we traversed the last third of the game - which had more challenges than the earlier portions. 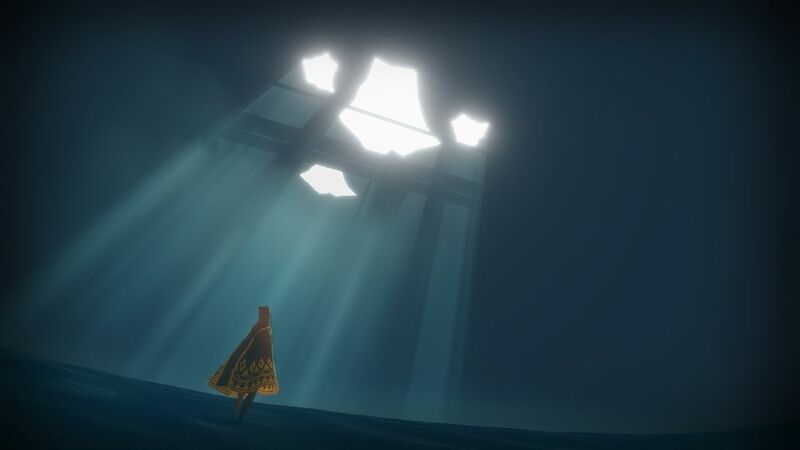 It soon became clear to me that this individual had already beaten Journey before, as they knew where to go and how to get there. I followed along, and especially during the last portion of the game's icy end, the two of us were braving the elements together, trying to reach our destination. Not a word was said between us, but I certainly felt like I shared and enjoyed the time spent together. Of course, not all is perfect. Some will be turned off by the fact that this is much (if not more) of an experience than an actual game or contest. The pace is also slow - not for everyone. The game itself is also relatively short. Even with all of my explorations, I probably beat it in about five hours or so. Still, the exploratory nature of Journey does invite you to play again once you have reached your destination. 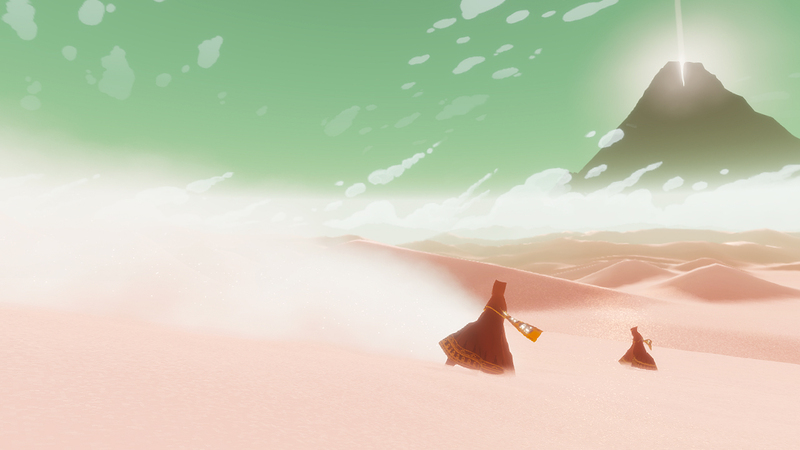 Journey is not your typical game - and that is a good thing because it is a breathtaking experience if that sort of pace and exploration appeals to you. My youngest had no interest in the game, my son played through almost all of it - though I do not believe he actually beat it - and my oldest sat there watching me play almost from start to finish. The appeal will vary depending on the individual, but I definitely felt as though my Journey was well worth undertaking. I've heard a lot about this one, but not played it. 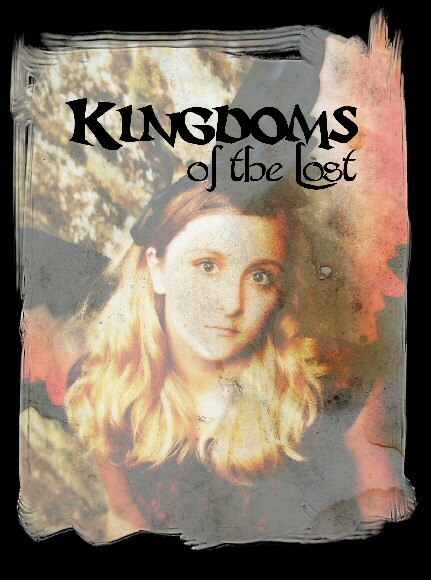 As for the gameplay, is this like a free-roam exploration game, with full 3D worlds/levels, or is it a 2D/3D mix? I haven't see any gameplay videos, and looking at the images I can't tell exactly. I've never even heard of this game, though it sounds like something I'd like to experience. Y'no, I once said to someone that we are living in the most creative gaming generation there has ever been, and they responded with "ARE YOU CRAZY?!?!" but this kind of thing is exactly what I mean, breaking the rules. This game wouldn't have been made fifteen years ago, and it would have greatly struggled ten years ago, only now is there such an open and inviting environment in the gaming community for boundary-pushing interactive experiences through the medium of gaming. Mass Effects insanely dialogue heavy, Limbo is minimalist in almost every way, even games like Scribblenauts are suddenly marketable. But anyway, I've ranted. The point is this looks very interesting to me, I really like that story about you meeting the other player, the way that you two can't even speak or see each other reminds me of John Lennon and Yoko Ono's bagism, having nothing to judge each other on but your interactions, it calms you both down, if you two had been able to speak to each other you might have driven each other crazy. "dang, that chalgyr has been clearing out clothes all night huh?" No idea what that's about. Looks like a pretty cool experience and something I'd enjoy. (especially the length) Too bad it's ps3-only..
Good morning. It's definitely a 3D world. There is a lot of exploration, and not necessarily a ton of direction. You have a general idea where to go, but Journey definitely wants you to explore and take your time. About 2/3 of the way through the game, I encountered another player and this person had a much longer scarf than me and seemed to know right where they were going, so I stayed by their side for about the last third as we darted around the environment together. Hey Robert, thanks for coming by to comment! The reference is toward an acquisition I made this weekend for Christmas (but didn't get to set up and um, test yet, sadly). The game is pretty cool - one even you'd probably finish. :) But it is definitely PS3 only. Hey Josef, glad you dropped in, thanks! Journey was one I heard a lot about early on and won a handful of awards, but I didn't grab it right at first. Then several months ago, it was part of a large sale so I nabbed it really cheap (like $3). Other really good examples as they are all games I really enjoy as well! And glad you liked the story. My oldest sat on the couch, just watching it while thoroughly amused by all of it - and she's most definitely not a gamer, but seemed to enjoy the ride. Okay, I did read where you met the more experienced player, but I just wasn't sure even when you encountered the person, how it was setup really. Some of the pictures had me curious if it was a 2D plain, or full 3D. Because I'm getting so many good questions about it, I added a gameplay video to the article for you guys to peek at. I think it does a good job of showing how your characters move about the world and interact with it, and showing off some of the platforming and 3D world. Oh, don't think you're going to take away from reign as the incomplete gamer! It's on now!